Dr. Victor Lyall Goodwill was born 3 February 1875 in Melbourne, Australia. He would graduate from Prince of Wales College and Queen’s University where he obtained his M.D. in 1899. He took a post graduate course in New York during the summer of 1899 and studied mental diseases at Rockwood Hospital in Kingston, from September 1899 until January 1900. 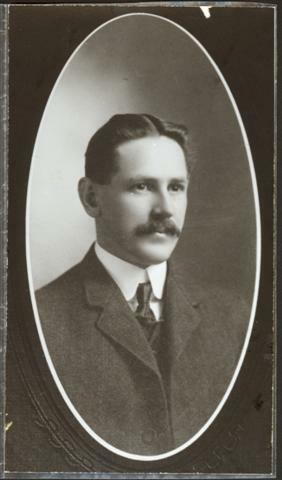 On 15 February 1900, Dr. Victor L. Goodwill was appointed Medical Superintendent of Falconwood Hospital, the Prince Edward Island Hospital for the Insane, a position he held until 1927, when he resigned to take up private practice. A veteran of World War I, Dr. Goodwill took time away from his employment to serve as Major in the Canadian Army Medical Corps from 1915-1919. Goodwill married Florence M. Reid (1876-1952) of Kingston, Ontario in September 1900. The couple would move in with Dr. Goodwill’s mother and would remain there after her death in 1930. Sadly, only five years later, Dr. Goodwill would die of a heart attack leaving Florence a widow. In the late 1940s or early 1950s, Florence Goodwill’s sister, Edith Olivia “Eva” Reid Bailey and her husband, Dr. William Louis Bailey, who had been annual visitors to Charlottetown since 1900, retired and moved in with Florence Goodwill. The couple would remain there until their deaths- when the property was sold and the house torn down.